Finding a place that provides quality kids haircuts can be a challenge. Add to that a child who does not like getting a haircut and you’ve got a recipe for frustration! At Locks of Fun, we have the solution – Kids Cuts With A Smile! 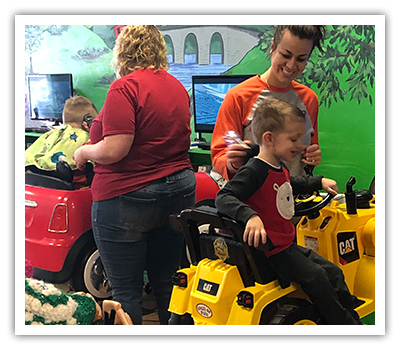 At Locks of Fun, your kids will enjoy a quality kid’s haircut and kids hair styling from professional stylists — they can even enjoy a kids manicure — all from the comfort of a Frozen Jeep, Fire Engine, Bulldozer, Lightening McQueen, Tractor, Princess Carriage or Police Car! 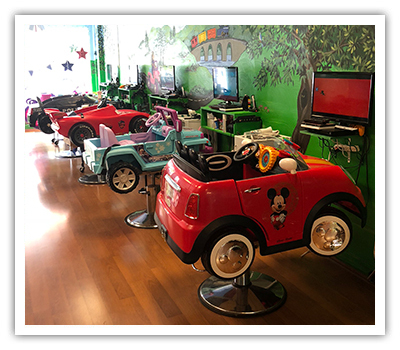 Not the real vehicles of course, but fun kids salon chairs your kids sit in to receive their own personalized kids haircut and style (for kids only, based upon availability at time of cutting)! Quality kids haircuts – for kids of ALL ages! With FREE popcorn and juice to keep them happy — and their choice of a DVD movie on their own flat screen television or a Game Cube game — they’ll smile the entire time! And with the promise of a special treat at the end, any child will surely sit still! Our newest addition to the salon is a special section for grown-up kids and adults. Here, we have Xbox 360’s and movies to pass the time. Enjoy our special group cuts such as Mommy and Me, Daddy and Me, Grandma and Me or Grandpa and Me, and your little one will enjoy a day at the salon with their favorite “big person”! We feature Circle of Friends®, SoCozy®, and Fairy Tales® hair care products for kids, as well as Johnny B® Styling products for kids. All of our kids products are kid-friendly, without all the harsh chemicals. Planning a birthday for that special youngster? Hold your next birthday party at Locks of Fun and enjoy a “stylish” affair including hair styling, colored gels, manicures and a walk on the Fashion Show Red Carpet in their favorite costume! 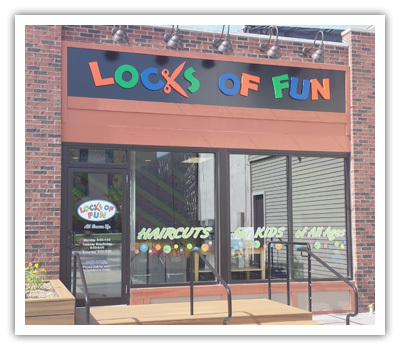 Come see the best and most unique kids’ haircut solution – Locks of Fun! Enjoy quality kids’ hair styling with less frustration – Kids Cuts With A Smile! Appointments are recommended. We work by appointment to reduce wait-time and distractions of waiting families in the fun family area. Join our E-Mail Club and receive a money savings coupon for the month of your child's birthday, as well as notifications of specials and promotions! Copyright © 2019 Locks of Fun. All rights reserved.